KU Public Safety officers stream into McCollum Hall Friday afternoon to investigate a report of man with a gun who was in the building. 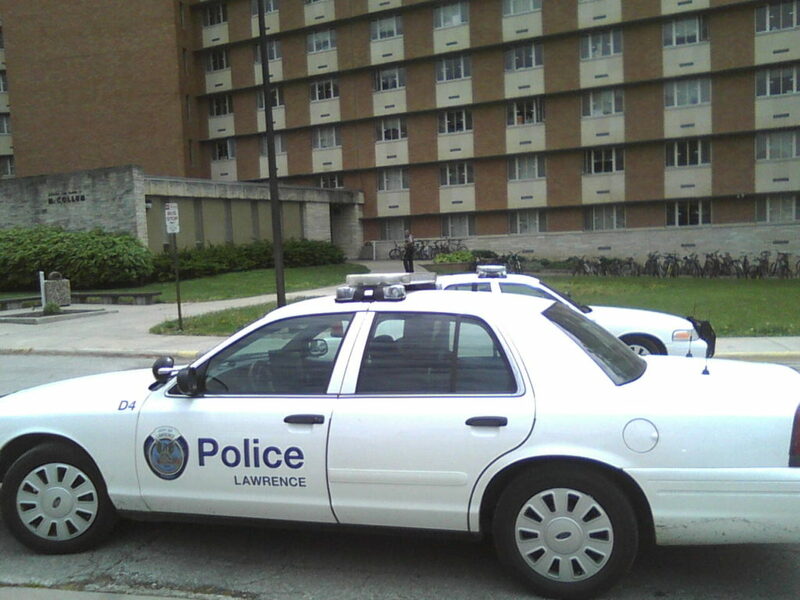 Police put the building on lockdown but have also checked at least two locations around Lawrence for the suspect. 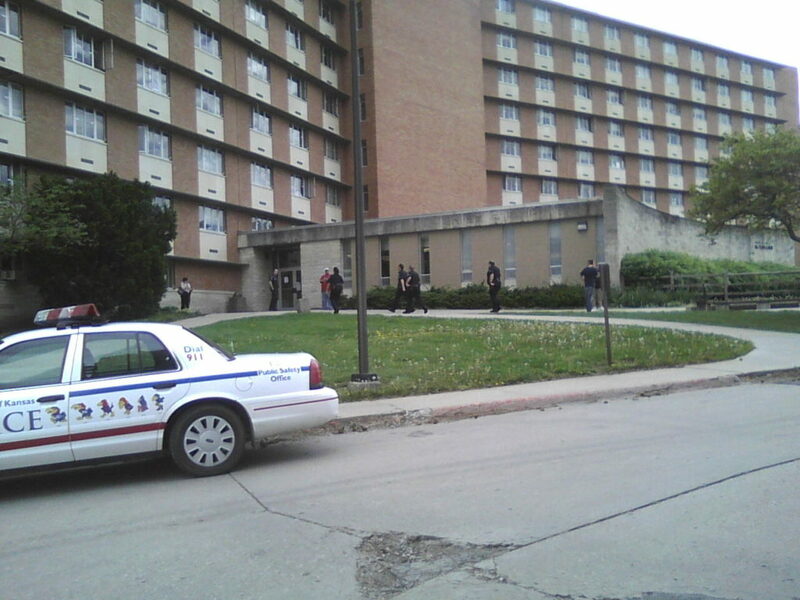 Lawrence Police and KU Public Safety officers surround McCollum Hall in response to a report of an armed subject in the building. Law enforcement has established a perimeter around the building. 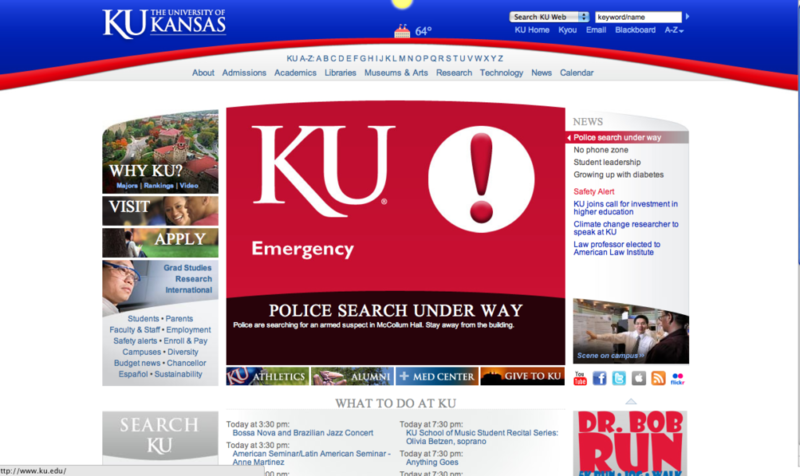 KU officials activated their emergency alert system in response to a report of an armed subject on campus. Students wait outside McCollum Hall on the Kansas University campus, where officers are investigating a report made Friday afternoon that a man has a gun inside the residence hall. After more than three hours of waiting, Kansas University students were allowed to return to McCollum Hall on Friday evening. Shortly before 5:30 p.m., police called off their search for a suspect believed to have a gun. However, the search continues for the suspect. According to KU spokeswoman Jill Jess, a person then saw a man with a gun and reported that to authorities. Jess said officials believed the suspect had left the building but “for the safety of our students” officers conducted a floor-by-floor search. Shortly after 2 p.m., KU began notifying students, faculty and staff about the incident via text-message and e-mail alerts. Jess described the suspect as a light-skinned black man, 6-foot to 6-foot-1, about 180 pounds, wearing a white T-shirt with brown trim, black sweatpants and white tennis shoes. The man, in his late teens or early 20s, has no facial hair. He has tattoos fully covering both arms. As police began their search of the residence hall, students inside were asked to stay in their rooms until their floors were cleared. The university as a whole was not under lockdown. A KU student named Kylie, who lives on McCollum Hall’s fourth floor and who was inside the building at 4 p.m. Friday, said police swept through her room three times to make sure she was alone and safe. “Rumors are causing people to panic,” Kylie said. Elizabeth Najim, a Wichita freshman, said she barricaded her door on the third floor of McCollum. “I hear some doors opening and closing, but I really don’t know what that is,” she said. When she arrived back at her dorm after astronomy class, she received odd text messages. “A bunch of friends texted me, wondering if I was OK,” she said. And then she received KU’s emergency text. “I started freaking out,” she said. Shortly after 4 p.m., Kylie said a police officer told her she could leave the building, but that she could not go upstairs as police had not cleared upper floors. As the afternoon wore on, dozens of KU students congregated outside the entrance to McCollum. At least a dozen police officers were outside the building while others conducted the search inside. Lawrence-Douglas County Fire Medical activated a medical task force and staged nearby at the Lied Center with several fire and medical units. No shots were ever fired and no injuries were reported. During the afternoon, KU advised McCollum students to go to a safe place and advised all other students to avoid the area. KU on Wheels buses were being rerouted away from the south end of Daisy Hill. McCollum is the largest residence hall on the KU campus and is among five dorms on Daisy Hill, near 15th and Iowa streets. The co-ed residence hall is home to about 900 students on 10 floors. Law enforcement officers continue their search for the suspect. On Friday afternoon, Lawrence police visited the McDonald’s on 23rd Street as well as the area of Sixth and Iowa streets in response to reports of a vehicle matching that of the suspect’s. 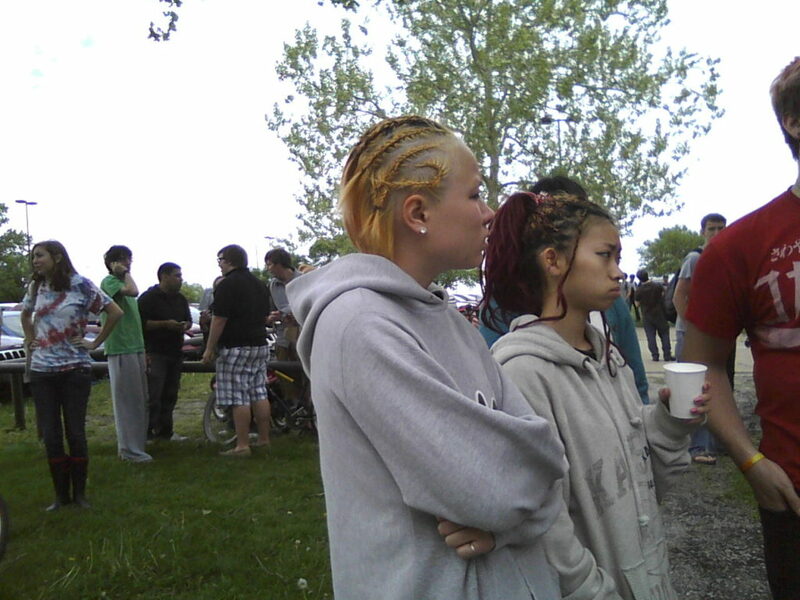 Anyone with information is asked to call the Lawrence Police tip line at 843-TIPS.